I was just beginning supper preparation a couple days ago when a torrent of rain, compliments of Ike, commanded my attention. 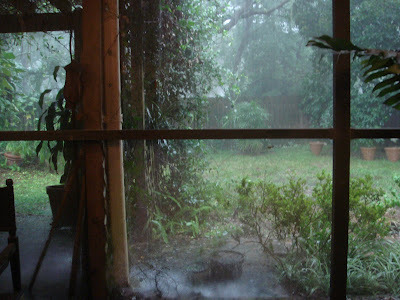 Florida thunder storms are marvelous things if you're snug in your home (as I was) and lucky enough to have a covered porch (I do) to sit on and enjoy the show. I love the sound the rain makes streaming off our roof so fast that it spills over the gutters in sheets to the ground. All the chopping and cooking would have to wait while I grabbed a glass and sat down to toast the splendor and give thanks for the joy. What sights and sounds surprise you with joy? That picture makes me want to tuck myself into a comfy chair with a good book in a quiet house and take a nap. rain is definitely a sound that brings me to a stop.. waves, trees in the midst of rushing wind. this is actually funny to read. i was running today after a shower in our neighborhood i glanced down the end of one street and saw the setting sun breaking in between the trees meeting the steam coming off the street. Ii just stopped and took a moment. And actually I felt like I should keep running, as though it was awkward or wrong for me to just stand there on a corner and watch. But I told myself that I was allowed to stop, to enjoy, to stare and reflect.